Norfork Lake fishing is in the beginning stage of the summer fishing pattern. Fish are starting to school, feeding in relatively shallow water before sunrise and then going out to deep water after the sun comes up. As summer progresses the stripers will continue moving out to deeper water and you will find them early 50 - 80 feet down on the bottom. As the sun comes up, they will stay at this depth, but will be suspended in the old deep river channels. 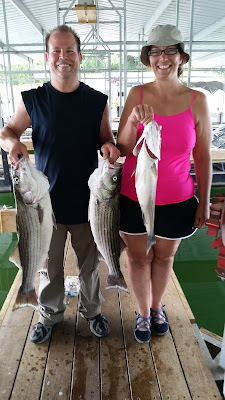 The striper and hybrid bite has been good most days. I am finding these fish in 35 - 45 feet of water feeding on the bottom before sunrise off of main long shallow points. As the day progresses they tend to keep moving to deeper water, but stay at about the same depth. 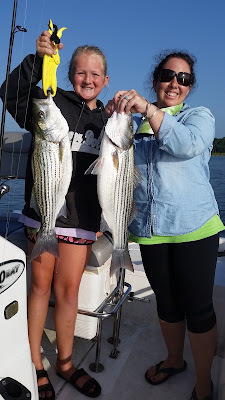 Live bait is working very well, but jigging with a spoon is starting to produce some nice stripers. Trollers are also having success as long as they can get their baits down to the proper depth. I am finding my stripers anywhere from the Robinson area to the dam. 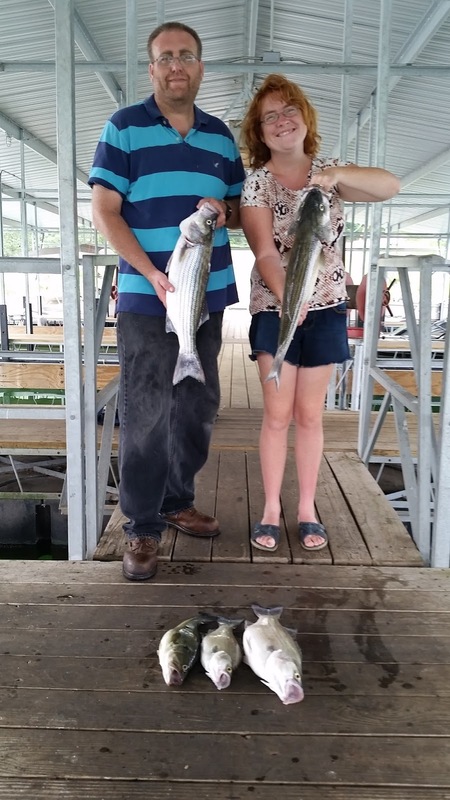 The striper fishing pattern is very typical to prior years with the exception of being several weeks early due to the lake warming up early this year. Crappie fishing is also in the warm water stage. They are harder to find, but when you do you can catch some nice fish. Look part way back in creeks close to brush in 35 feet of water. The crappie will be 20 - 35 feet down. Jigs and live bait are both working. 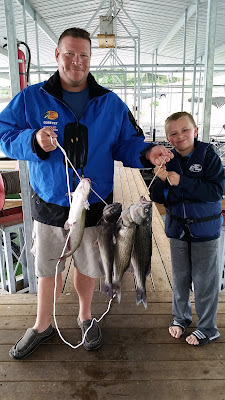 Catfish are also biting very well some days. You will find them in the same locations as the stripers, as they are also following the shad. I have found some nice channel cats in about 34 feet of water while striper fishing. When you hook one they typically will not run like a striper, but instead are very difficult to get off the bottom as they keep digging straight down. Fun to catch. Large mouth and spotted bass can be found along bluff lines in 20 - 35 feet of water. Look for ledges and good chunk rock points. Work jig and pigs or your favorite plastic bait along the bottom. The after dark bite in the evening is producing some very nice fish. Norfork Lake level is hold fairly constant and currently sits at 552.73 feet above sea level. The surface water temperature is also holding constant and is in the mid 80's. The main lake is clear with the creeks and coves somewhat stained.